If you struggle to work-out on a consistent basis, it’s likely some sort of perception you are harboring about it. That’s what needs to shift first. Look into yourself and your beliefs. If your beliefs have you perceiving exercise as a chore and something you must push yourself to do then switch it up. Change your perspective and begin thinking of your exercise program as medicine. Because that’s exactly what it is. Imagine in your mind the kind of medicine that brings about positive changes towards reducing human and financial losses associated with chronic life threatening diseases on a personal and global basis. This kind of medicine is healing and preventive. It is the key to self-care that regenerates the body and mind and rekindles the spirit adding years to your life and zip to your years. So much gain for so little outlay. In the end, no one is going to care about your health more than you do so it only makes sense that you would take control and be part of it. It is important that the right exercise program is undertaken if you want to reclaim your strength and your youth. And, although we all love recreational activities (they are very important to an active lifestyle) like walking and jogging, they will not give you the right kind of challenge needed to sufficiently rebuild lost muscle strength. All that’s needed is for you need to set aside is between 2-3 hours a week to perform your exercise program. 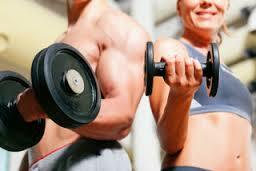 In fact, most modern exercise programs containing strength training can be performed easily in under an hour. The last thing you should be doing is living the kind of life that will require doctors and drugs in the future in order to fix you once you begin falling apart…when things begin to break. By being proactive, and staying strong and fit now and going forward, you protect your future. You get numerous benefits like an increased life span and improved quality of life which enables you to keep up with your children and your grandchildren. So, the choice is yours. You can choose to become a medical statistic by doing nothing or start now and take an active role in preventing killer diseases and increasing your longevity. In the end…we are all making life or death decisions every single day in terms of what we choose to put into our bodies and how we choose to use them. Those decisions actually filter all the way through to your DNA. In other words, the way you live, your exercise habits, eating habits, sleep and stress management as well as other habits do change the environment of your genes…and in turn that changes what they do. By adopting a healthy lifestyle you can give your DNA a makeover…a second chance of sorts, and move your life away from the risk of disease rather than into attracting it. The controls are in your hands…only you can build a strong, fit, lean and healthy body…one with optimal disease protection. Bottom line is it is far better to keep the good health you have rather than to try to recover it after it is lost. It might be wise to put a little yellow “sticky” reminder somewhere or many places around your home to remind yourself of why you need to keep exercising and eating healthy.